A dark mood enveloped the seasoned fisherman as he dragged his boat onto shore. Pulling an empty net up beside him he began to wash away the night’s debris. Simon could hear the Rabbi’s voice speaking softly and firmly to the crowd further up the beach. But he was tired, sore and irritated at the futility of his all night effort and listened only half-heartedly to the Rabbi’s words. Pressed by the pushing crowd the Rabbi stepped into the fisherman’s boat, asking Simon to pull out a little from the shore so he could better address the people. Simon didn’t mind, in fact he was quietly proud that Rabbi Jesus had deemed his little fishing boat fit for His purposes. He had had his own encounter with Jesus not many days before when Andrew and John had excitedly sought him out claiming to have found Messiah. Not being one for fables, Simon had gone to investigate their fanciful tale. But soon Simon too was intrigued by this unknown prophet who had apparently come wandering in from the wilderness with His tradesman’s hands and disarming smile. Jesus had looked directly at the suntanned fisherman smelling of salt and sea, and stated: ‘You are Simon, son of Jonah, but now you’ll be called Peter’, as if they had been acquainted for years¹. Amused, Andrew and John had wasted no time in teasingly addressing him by his newly acquired name. And that was that. Something unfamiliar had been stirring deeply inside Simon Peter ever since that strange encounter. He was further unsettled when Jesus had healed his own mother in law and many others in his village. If he was honest he would have loved nothing more than to follow Jesus for a while and learn more about this new Kingdom of which He spoke. But a fisherman knew his place. And besides, there was a business to run and a family to feed. That is if he was really any sort of fisherman at all, which right at this moment he very strongly doubted. The empty net in his hand was evidence enough of the many nights he had given the best he had in him, yet still returned in the morning with nothing to show for his backbreaking toil. Simon’s sober thoughts were interrupted by the Rabbi’s voice: ‘Go out where it’s deeper and let your nets down for a catch’. As much as he respected Jesus, Simon quietly doubted this Rabbi had a high level of proficiency in fish-catching. Any good fisherman knew that night was the best fishing time. ‘Master, we worked hard all through the night, and didn’t catch a thing,’ he replied despondently. The resulting catch was far more than one little fishing boat could handle. And when the others responded to Simon’s shouts for help the multitude of fish kept coming, more fish than any of them had ever seen. Empty nets, newly cleaned and mended, soon broke apart under the strain. Boats, filled to overflowing, threatened to sink. And in the midst of the chaotic scene a simple fisherman named Simon knelt before a mysterious rabbi-prophet-messiah and worshiped Him. Have you ever gotten tangled up in an empty net? I’d argue that you probably have. That smelly old net might even be wrapped around you right now. The thing about empty nets is they demand our attention. All. Of. It. Simon Peter had an empty net problem. The name of his empty net was ‘Failure’. It’s no fun to work your heart out all through the dark night and find you’ve got nothing to take home when morning light appears. And if it’s happened more than once…well, you know. Pretty soon life becomes all about that old empty net, with its great big upper case ‘F’ stamped on it, and everything else fades from sight, right? I’ve been there, trust me….more often than Simon Peter had fish dinners. Maybe your net doesn’t have an ‘F’. Maybe it has an ‘S’ for Shame, a ‘D’ for Dumb, an ‘R’ for Rejected, or a ‘W’ for Why. There’s no shortage of empty, stifling nets vying for our undivided attention. Typically, Simon Peter’s empty net had stolen center stage and had become his only perspective. Entwined in its fibers he was unable to see what Jesus could see – an unprecedented school of fish poised to break that empty net and usher in a brand new season in Simon Peter’s life-journey. And then the fisherman left all – nets, business, boats – and followed His Messiah. Forever. We read this Bible narrative found in Luke chapter 5 and we marvel at the miracle of the fish. But the beautiful wonder of what happened that day on Galilee Lake is not so much the great catch of fish as it is the broken nets that just moments before had lain empty and ugly in the fisherman’s hands, a symbol of fruitless toil. Our journeys are not yet completed. The ink has not dried on our histories. Our Lord is not done with us. He is peering through the empty nets we so often wear as shrouds, calling us onward to new journeys and spiritual vistas as yet unimagined. He loves us too much to leave us entwined in our empty, suffocating nets. He believes in us too much to let us go home to bed. Simon Peter could have continued clinging indefinitely to his toxic empty net, allowing it to go on defining his life and his future. He very nearly did. 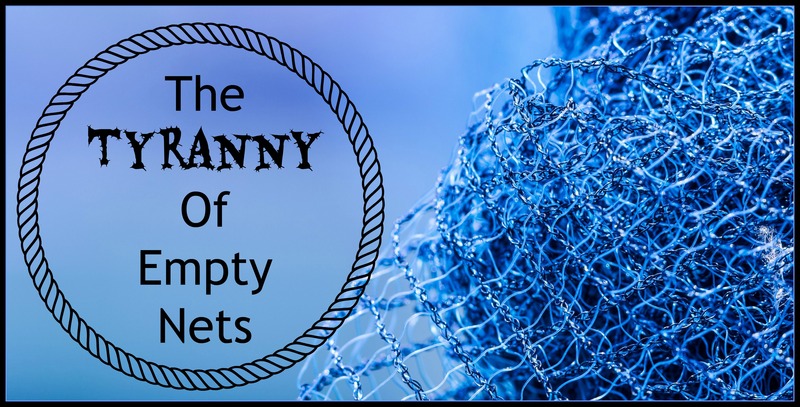 We too can live paralyzed and defeated by our empty nets, like a discouraged Shulamite lamenting: ‘I have taken off my robe; how can I put it on again? I have washed my feet; how can I defile them?’² Can anyone identify? But a gentle familiar Voice whispers: ‘Come with Me out into deeper water, and let go of your net. This journey’s not finished, I have so much more to show you. You have already given up so much for Me, but to follow Me further you need to surrender that old empty net that is slowly crippling you. Trust Me, I know what I’m doing’. 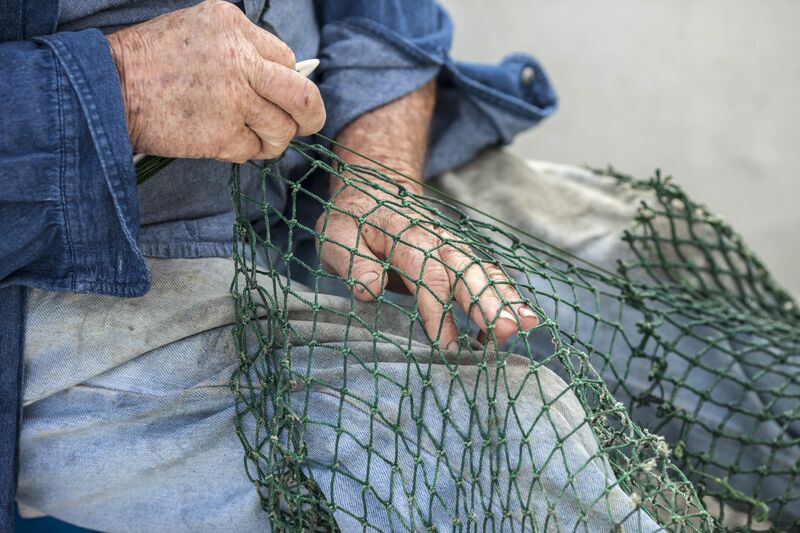 May you hear the Filler of Empty Nets whispering to your spirit this day. And may all your empty nets be broken. © Cheryl McGrath, Bread for the Bride, 2015 and beyond. Copyright Notice: Permission is granted to freely reproduce any Bread for the Bride articles in emails or internet blogs, unaltered, and providing this copyright notice is included. To permanently display an article on any static website please contact me for permission. Do I detect a theme?